For some time, online gamers have been treating their virtual lives as just another part of their offline lives. Millions around the world play, meet up, battle, buy and sell in online games and virtual worlds, such as Second Life and World of Warcraft. But to many, these virtual goings-on can be a total mystery. Armed with his lens, photo journalist Robbie Cooper has been facing up to gamers, revealing their intricate lives and identities to the rest of the world. Last year, his Alter Egos exhibition in London showed off the people behind the avatars - their virtual representations. It was a fascinating and comforting peek into the very ordinary and familiar faces of gamers and virtual worlders. This year, he has cast his lens further afield into China and Korea to get the stories behind the avatars. "I wanted to build on what I had done before and get more cultural variety and more personal variety," he told the BBC News website. "I wanted to see people who use female avatars, women who use male avatars, and also people who earn their living from doing this - from buying and selling virtual goods, or creating programs to operate people's characters." One player he met in the virtual world, Second Life, earns $70,000 a year creating female avatar clothing, he says. 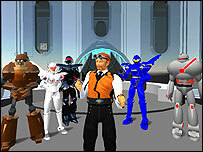 Another player, Mark (aka Marcos Fonzarelli in Second Life) has turned himself into a "robot tailor", designing robot costumes that characters can wear. Admittedly, it is a niche market, says Mark, but he still earns $250 a month. The only resource is his time, for which people pay; there are 60,000 members who could potentially pay. According to the robot tailor, the real money is in the female clothing market. Mr Cooper says that makes sense when one considers the hugely lucrative beauty and clothing market in the physical world. It seems natural that the same kinds of rules and practices that occur in physical life will happen in virtual worlds too. That became evident when residents were urged to donate to the Katrina Hurricane aid effort, via the game. A virtual memorial with candles was even created. "We live in a virtual world anyway," says Mr Cooper. "Democracy is virtual, politics is virtual; all this stuff and information we get in the newspaper - a lot of it is public relations stuff." But Mr Cooper's pictures show that those boundaries between the virtual and the "real" are blurring in other parts of the world, particularly in Asia. The photos captured the fascinating and largely unseen world of workers in China and Korea who earn their keep by looking after people's characters in games while they are at work, or asleep. Qing Xu Wei, for example, used to make 10,000 yuan (£692) a month by power-levelling other people's game characters while they are away from the game. The programs he creates runs on seven computers, each churning out power points so that gamers can get their characters up to a certain strength and status. "From their point of view it is understandable. When a new game comes out, do you want to start at the bottom or have someone do that for you to get to level at which it is fun to play?" he explains. One shot shows what, at first glance, might be mistaken for a virtual room from within a game. With newspapers as wallpaper, posters of fantasy figures, and scruffy bedding, it is in fact a room in a net cafe in Tianjin, China. It is used by employees who work for a dollar a day levelling up player's characters. Up to 30 will work for 16 hours, using the room to sleep in shifts. To Chinese gamers, it does not seem unusual that there would be people working on every level of the economic food chain, says Mr Cooper. The gamers there, he added, had reams of stories about in-game cheating and stolen accounts. Buying and selling gaming items such as imaginary weapons is a booming business on the web. The internet games section of Ebay saw more than $9m (£5m) in trades in 2003 alone. "A commodity is a commodity. If it is worth something, people are going to work hard to make the money. In China, there is matter of fact attitude about it," he says. Earlier this year, a Shanghai online gamer was given a suspended death sentence for killing a fellow gamer when he found out the friend had sold his virtual sword, which he had lent him, for 7,200 yuan (£473). This kind of criminal activity which happens as a result of events occurring in a game could become more common. China has no laws to deal with the theft of virtual property. But in South Korea, where gaming is treated as a mainstream sport, there is a police unit that investigates in-game crime. According to Mr Cooper, this shows how seriously gaming is being taken, especially when real-life money and value plays a part. "A lot of people I met did not have as much sentiment about the games as they do in the West. In China you do what you have to do to get by," he explains. But there is more to "value" in game playing than just economics, says Mr Cooper. "This whole thing is about value and if people are willing to pay money for something, it has some kind of value to them. Value is more than money; it is emotional value, time, and work." When gamers find emotional value and a sense of accomplishment through online games and virtual worlds, that can sometimes be just as worthy. Mr Cooper's most recent photos will be on show at a PlayStation 2 supported exhibition tour starting 9 November in Amsterdam.